The training Consulting Led Selling offers you the skills to connect your knowledge and expertise to the strategy of your customers and develop the right solutions to solve their problems. It also helps you to convince the client to accept your solution. Eventually, you must also be able to manage change while implementing your solution. Only by changing the customers' current status quo your are able to realise the benefits of the solution. 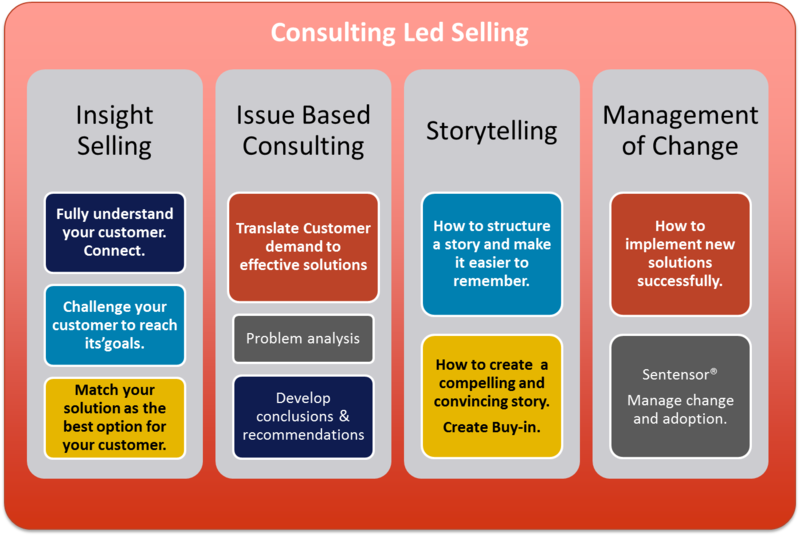 The training Consulting Led Selling is a combination of theory, methods, tools and skills. That’s why the course is practical and based on real life case examples. You learn by doing. Our integrated approach consists of 4 main elements and offers the value of all our other training courses in one course. Change Management: Kennis van Change Management is essentieel om uw idee ook effectief te implementeren. Though it will help professionals to gain more business. Consulting Led Selling is not a sales course, it is about gaining business by solving problems and building trust and commitment based on your knowledge and expertise. This can be done by sales professionals but ideally by consultants, managers, and other professionals in the field.